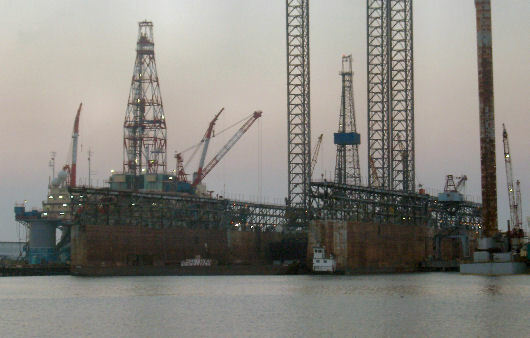 In the summer of 2005, the two AFDB-9 dry dock sections were wet towed from Philadelphia, PA, to Galveston TX. Each dock section measured 350 x 229 ft. A wet tow feasibility study was performed, including a detailed stability analysis (intact and damaged) and hull bending moment calculation in waves. After a long tow, with a stop over in Key West to avoid some hurricanes, the dock sections safely arrived in Galveston and were put to work. Estimate required bollard pull for the tow.